Touch here to purchase on Amazon. 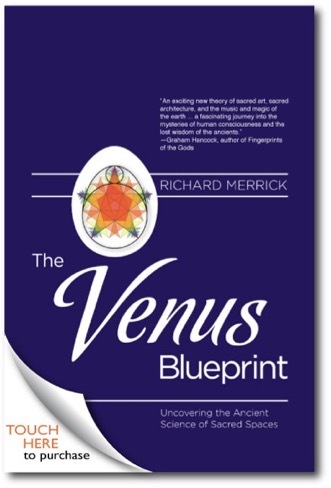 The Venus Blueprint makes the startling case that the orbital resonance pattern of Venus as seen from Earth was central to the development of early science, religion and government. Throughout recorded history, the pentagonal cycle of Venus has been repeatedly associated with the feminine aspect of God from Babylonian Ishtar and Indian Shukra to the Saxon goddess Eastre and Greek Aphrodite. New evidence now suggests that the orbital geometry of Venus, tracing out a rose pentacle between the Sun and Earth, was used as a sacred fertility symbol to design the world’s greatest temples. Revealed here for the first time, this is the story of The Venus Blueprint. The evidence begins with the discovery of a Vedic religious symbol known as Mount Meru etched into the sacristy wall of 15th-century Rosslyn chapel. This one symbol leads to a cascade of revelations suggesting this Roman Catholic collegiate chapel was actually designed to celebrate a much older Vedic cosmology known today as The Birth of Venus. A step-by-step analysis explains how the Blueprint symbol was used to design the chapel’s acoustics, placement of architectural symbols and overall floor plan. More significantly, the same Blueprint pattern is shown to match the Great Pyramid of Giza, the Temple of Jerusalem, the Greek Parthenon, Roman Pantheon and St. Peter’s Basilica in the Vatican, among others. Supported by an impressive array of historical research and scientific analysis, the Venus Blueprint geometry is then used to unlock the original purpose of these temples. Used for its resonant properties, it had the power to enhance entheogenic ritual and help induce religious visions. As the ancient “temple template” for a global Vedic empire, this Blueprint was once the key to enlightenment, liberating the gods within. In the end, the Venus Blueprint emerges as perhaps the single most important symbol in human history. Indeed, it is our best evidence yet that an ancient harmonic science did exist and became the inspiration behind the Vedas and many other religions. Through it, one can sense the light behind all religions straining to shine through--a beautiful musical light founded on celestial cycles and the universal harmonic principles of nature.